Gumbo is one of those dishes that there are as many ways to make it as there are cooks. I love to make a great big pot of it during the summer, when there is loads of fresh produce available to make it with. I have a tendency to throw everything but the kitchen sink in my version. I use both a roux AND okra to thicken mine. 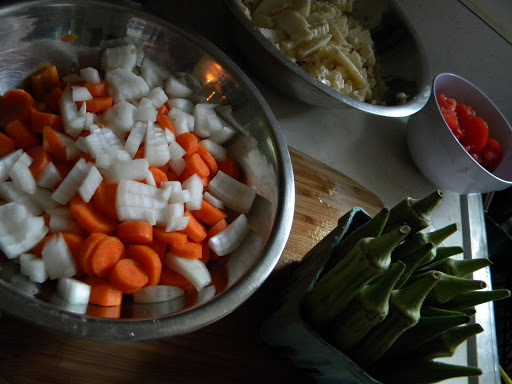 I like to have everything chopped and prepped before I start, mainly because I like to throw the vegetable scraps in a pot with the shrimp shells, fill the pot with water and simmer it to make a nice broth which I use in the stew. As I start sauteing the vegetables and making my soup, I also start my roux on the burner next to it, which cuts my overall cooking time. I use peanut oil in my roux, which has a higher smoke point, and it allows me to turn the heat up a bit higher, which can make your roux brown faster. I just heard about this microwave method, where you start off with it in a glass bowl for 3 minutes, then stirring it every 30 seconds until you get the proper color. I haven’t tried that, but I might next time. 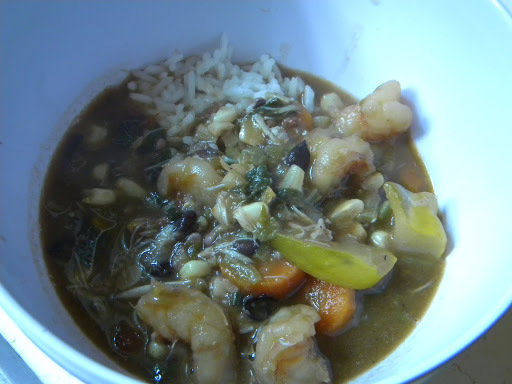 My gumbo is more than just seafood or meat, it’s also a darn tasty vegetable stew. In addition to onions, peppers and celery, I like to throw in tomatoes, carrots, corn, squash, beans and any other vegetable I have on hand. My last batch of gumbo had kale in it as well. I use a locally made Andouille sausage from Double H farms in Nelson County. It is good stuff and tastes like the sausage you can find down in Lousiana. I have tried other andouilles and I will only use Double H’s in my gumbo. (I keep a stash of it in the freezer, next to my butter, bacon & bread. You know, things you never want to run out of.). Good sausage really makes a difference. I cannot emphasize enough how much a good dark roux can add to your gumbo. Despite every recipe you’ve ever read that says you need to stand over it stirring for a long time, you don’t. Yes, you do need to pay attention to it, don’t walk away for too long, but, if you have it at the right temp and you know what you’re doing, you can be a little bit loosey goosey with it. Or try the microwave method. Heat the oil in a heavy pan, preferably a cast iron or stainless steel. When oil is hot, add the flour a little bit at a time and blend into a paste using a wooden spoon. 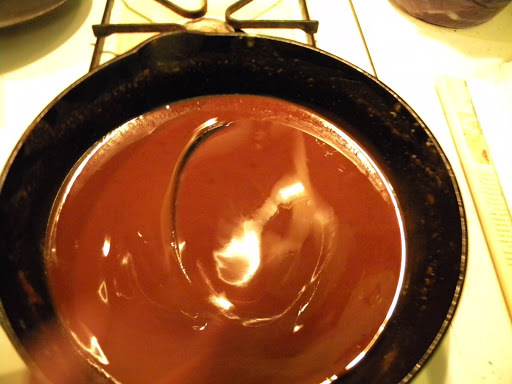 Cook over a medium heat, stirring constantly until it reaches the desired color. It will gradually deepen in color from beige to a dark brown. black beans or red beans or both! Combine vegetable scraps and shrimp shells in a pot and cover with water. Add a bay leaf and bring to a boil, then simmer for at least 20 minutes. Strain and set aside. You will need 6 cups of broth, so if you don’t have enough of this, use a little chicken stock in addition for some nice flavor. Melt the butter in a large stockpot. Add the chopped onions, peppers, and carrots. Cook until the onions are softened over medium-low heat, about 6-8 minutes. Add the sausage and cook for another 5 minutes. Add okra & garlic and cook until the okra stops producing white ‘threads’. (This can take about 15 minutes or so). Add thyme, bay leaves, salt & pepper. Stir in 6 cups of broth and the tomatoes. Bring to a boil, then simmer over a low heat, slightly covered, for 20 minutes. Add any other vegetables you want and whisk in the roux. Raise the heat and bring to a boil, whisking well. Simmer over a lower heat, uncovered, for 40-50 minutes. This should yield you one large stockpot of deliciousness that will taste even better over the next few days. It freezes beautifully, so I always like to stick some in the freezer for one of those winter nights when I don’t want to cook. Frozen okra will work instead of fresh, if you can’t find it or want to make a pot during the winter months. You can also add cayenne pepper and/or hot sauce. When I make this during the summer, I am generally looking to utilize some of the hot peppers I have collecting, so my gumbo gets it’s heat that way. Feel free to add chicken, oysters and anything else you can think of to it!